Last weekend my daughter Chelsey, my sister Polly, my niece Tana and my grandnephew Maxx came to stay for a couple days. We really had a nice time together. It is great to have family come stay. Chelsey's birthday is this week and we celebrated it when she was home. Here she is with Allison looking at her birthday cake. Polly and I did some sewing together while she visited. Here she is holding up her finished flimsy of the Picnic Quilt. She had it all completed except the outer border. 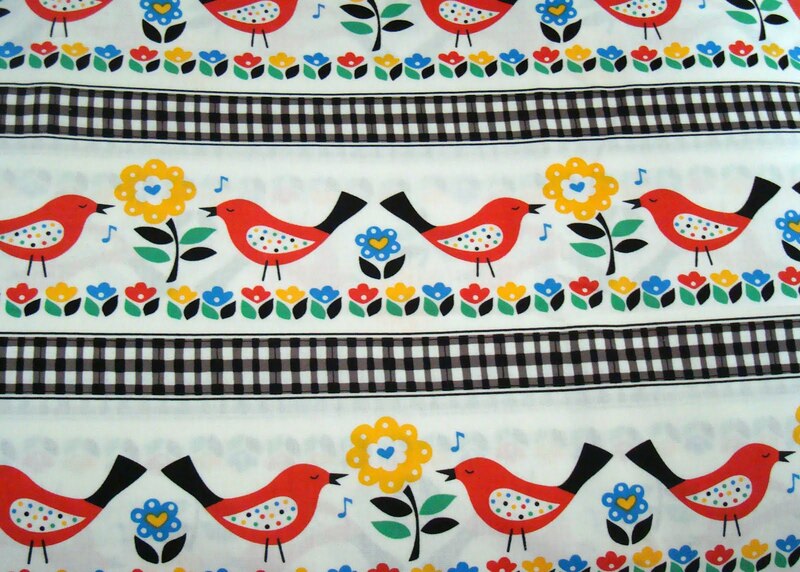 Polly is planning on hand quilting her quilt. I am so impressed with that kind of determination. We completed this huge (king size+) quilt top that Polly has been working on for almost a year. She hand appliqued the circles. 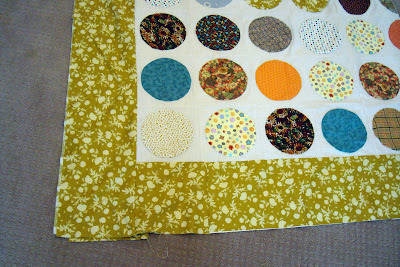 So while she was here we laid out the circles, sewed them together into rows, joined the rows, and stitched on the border. 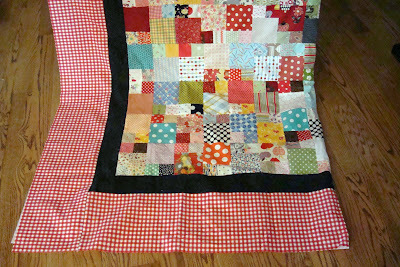 The quilt is so large that I can't really show it in completion. 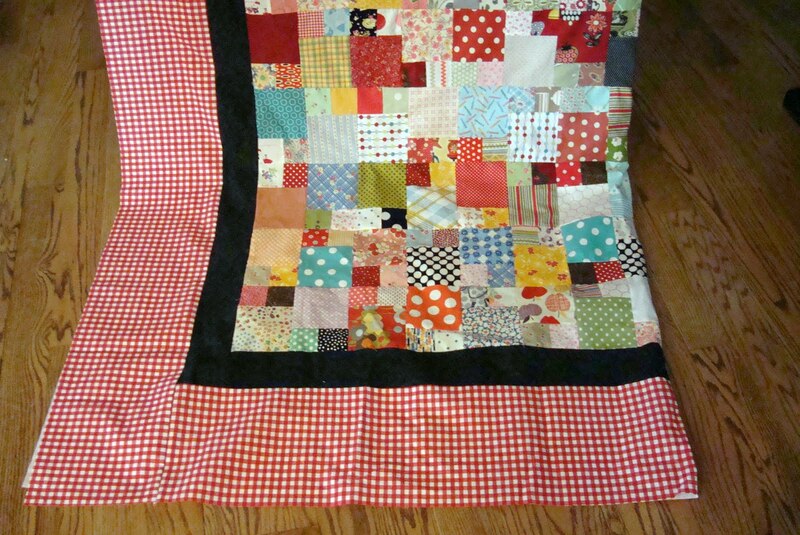 I was excited to help her get this flimsy ready for quilting. 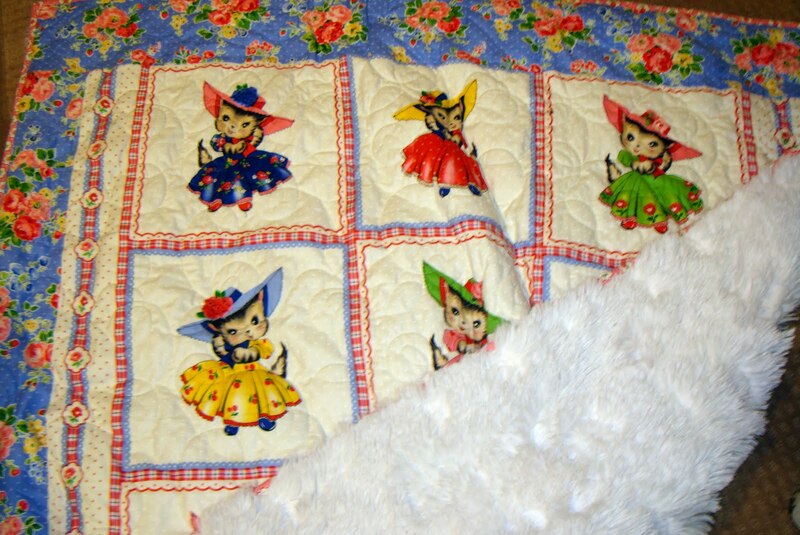 It is going to be so pretty on her bed. It is Fabric Friday again today. I have 5 prints to show that are fairly new to the market. 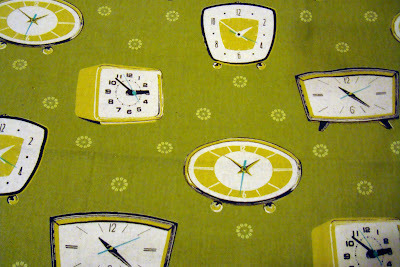 They are all great prints and have that vintage/modern flair. The first 2 prints are from Melody Miller. 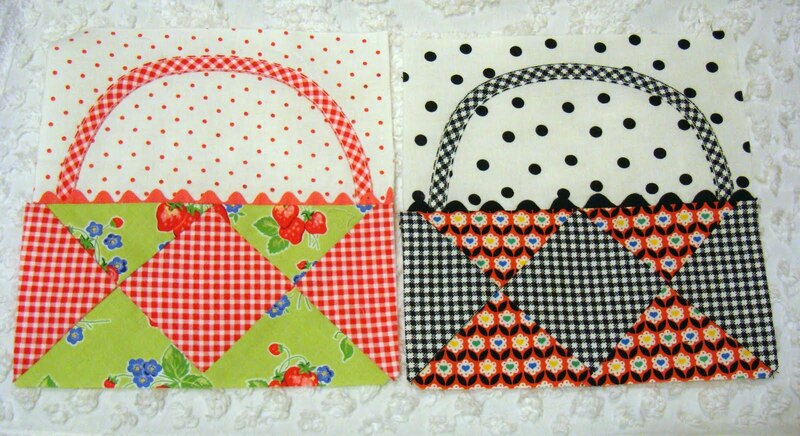 They are thicker linen/cotton blends that would work great in making bags. I love the 60's kitchen/flower/home feel. Out of all Melody's newest line this clock piece is my favorite. I do love old clocks. The one in the bottom right hand corner is the exact clock I had in my bedroom growing up. I remember when it broke and had to be tossed. I wish I still had it! 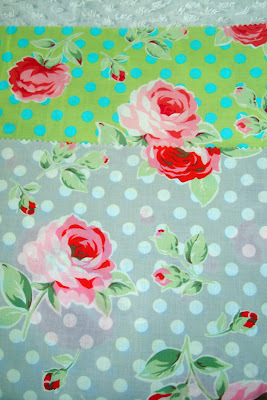 The next 3 fabrics are Michael Miller prints. I adore strawberries. And I love dots. This color green is a great shade, too. I really wish I had yards and yards of this one. 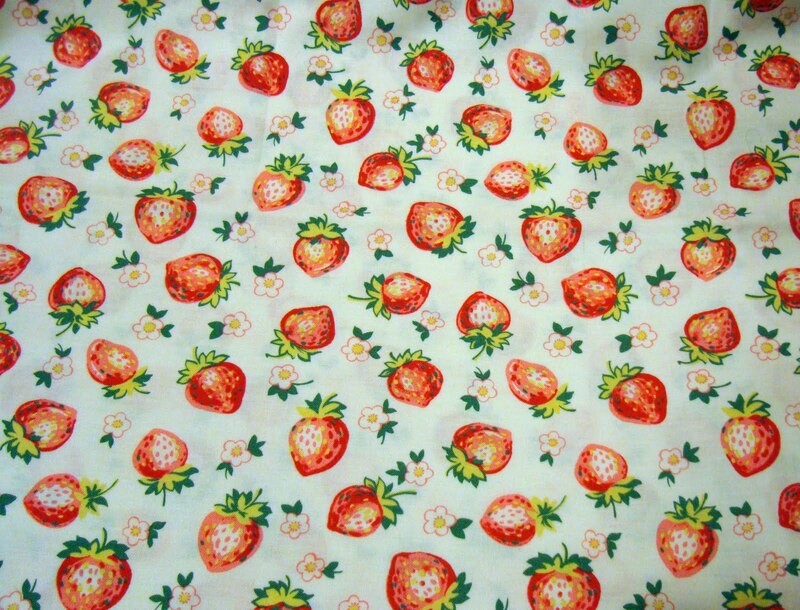 This is another Michael Miller strawberry print. I think it's super cute and the perfect size berry to fussy cut. 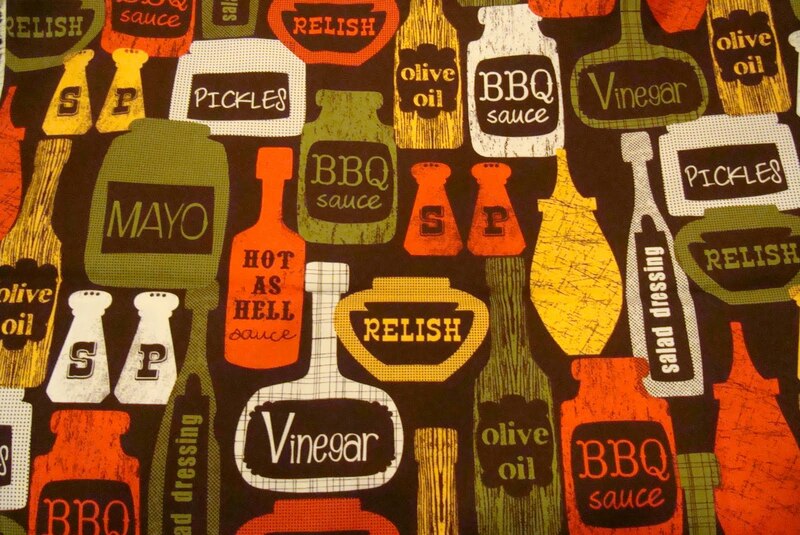 This kitchen print is a little bit '60s. I actually have a real vintage print that reminds me of this retro print. 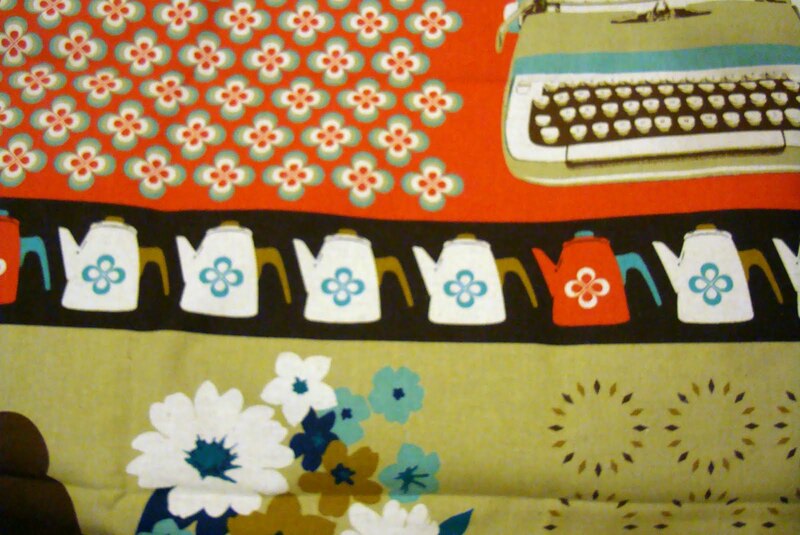 I'm not sure when or how I will use this novelty fabric, but it is certainly one that makes me smile. I have dozens and dozens of blogs I (try) to read regularly in my Google Reader. I like to read blogs several times a week but I rarely zero out my Reader in my quest to see what everyone is making. I have so many favorite blogs but currently I have a few that I am dying over. Sometimes I find these blogs so fantastic that I love to hate them. Well, not really, but I do envy the beauty and creativity there just a bit. I've been wanting to blog about these blogs for a while now so today I'm going to pass on a few links that I'm obsessing over. Nana Company. Holy Cow. Amy is amazing and her style and technique is perfect. There are so many of her projects I'm wanting to copy that I couldn't list them all. Barbara from Oodles and Oodles is my guilty pleasure. 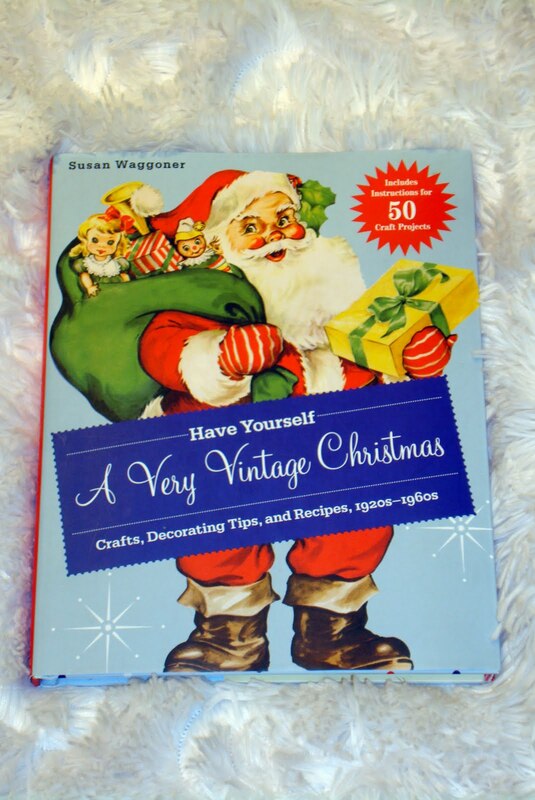 If you have the time, go back and look at the Christmas items on her blog. Her vintage treasures are like stepping back into a perfect time. I would love to shop just one day with her. Serena at The Farm Chicks really makes me go green (with envy). She has built a beautiful new home that is the perfect blend of vintage and modern. 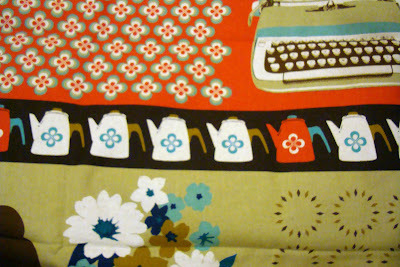 She sews, she crafts, she cooks, she has a vintage shop, she's a business woman and she writes books. There I said it - she does it all. Kerry at VeryKerryBerry is makes fabulous things. 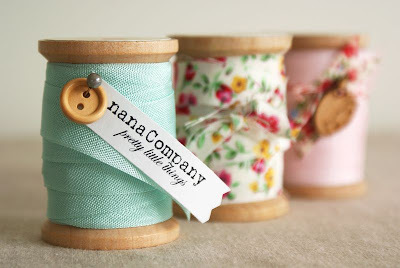 I love her fabrics and her projects. Everything she makes is just so darling. 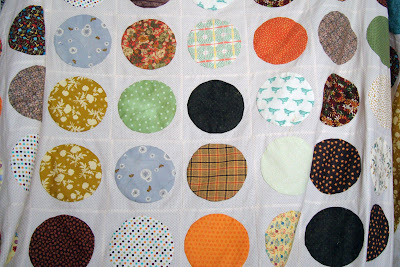 Many of these women have free patterns and tutorials on their blogs. They also have etsy shops. They are all beautiful women with so much talent. Bookmark those links and you will see why I love to read them (and hate them just a teeny bit). 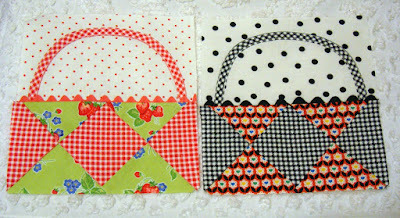 I don't remember if I showed this little group of fabrics before on the blog but since I'm working with them they are close at hand. This is a line by Benartex that has been out for a little while. It is called House and Home. It also comes in pastels, which I didn't care for. Anyway, it is a happy line that I really need to put to good use. 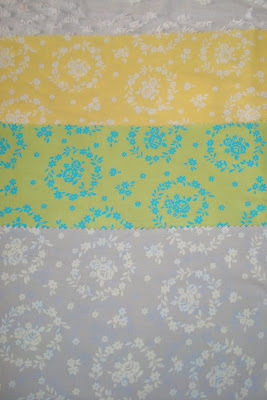 I'm proofing my pattern by making new blocks for my Row by Row quilt. and it seems to be working out so far. 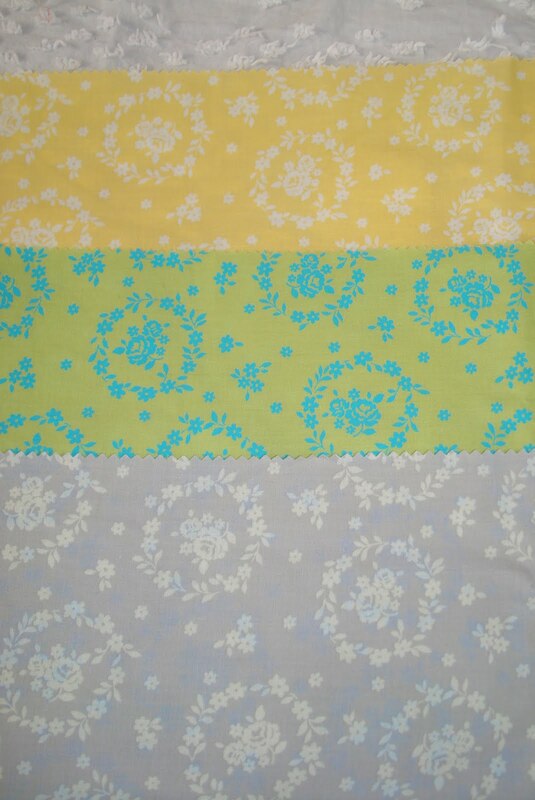 I really do like this border type print in the line and I'm going to use this to frame my blocks. I think it gives a Spring feeling and I'm excited to use it since Spring really is just around the corner. The sun is out today shining in my window but in Utah it feels like we haven't had Winter yet so maybe Spring will be late. When it comes I'll be ready for it. I'm photographing and writing instructions for my row-by-row quilt. I wanted to show that the pattern could be used with different fabrics and in a smaller sized project like a wall hanging. So I'm making each block again and writing instructions as I go. 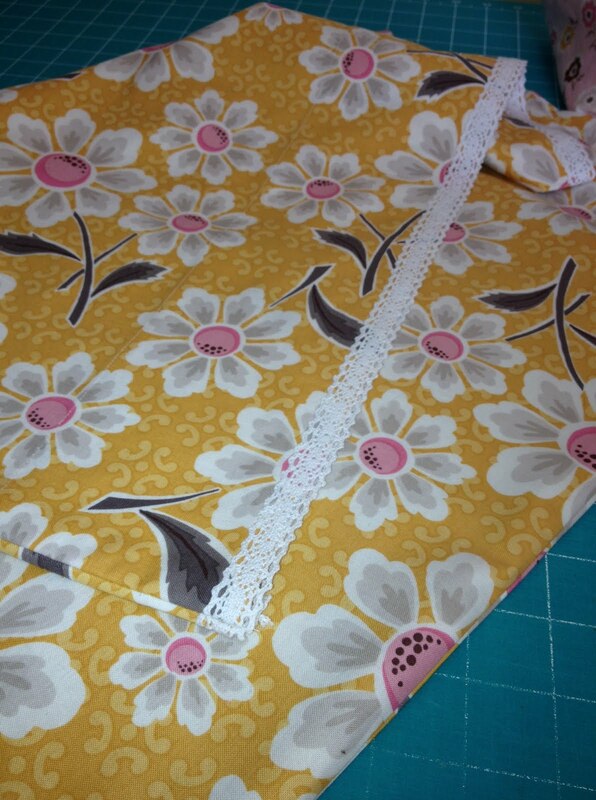 It is always amazing to me how using different fabric makes such a huge difference. Right before Christmas Lori Holt and I had lunch at our favorite spot, Food For Thought, in Draper, Utah. It was a crazy day and Lori was gracious enough to reschedule the time after I no-showed her (like I said, crazy day). Lori ALWAYS gives the best gifts. She gave me this darling project bag and her pattern for the crochet edged pillowcase. 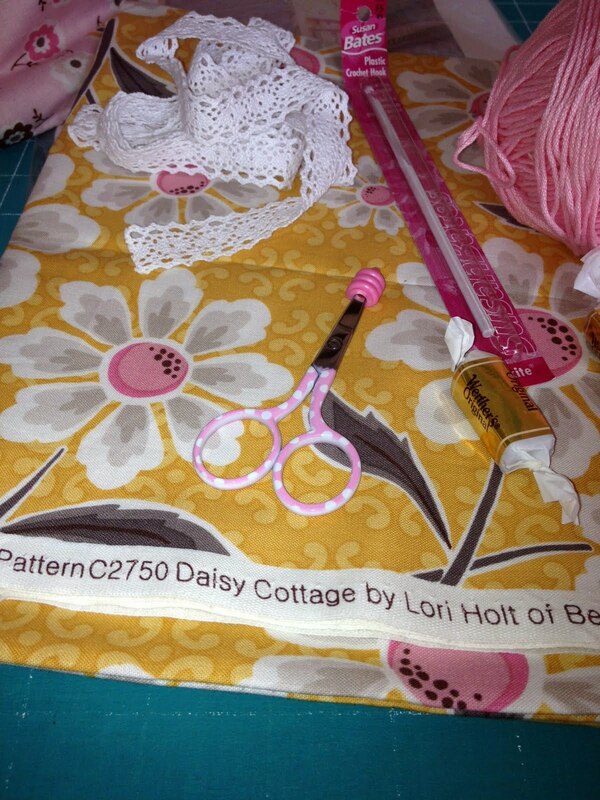 The fabric used is from her Daisy Cottage line and the pattern is one of her very latest. 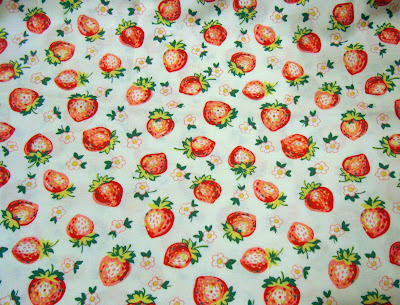 Inside the project bag was this great kit with everything to make a pillowcase along with the prettiest scissors and some of my favorite candy. I have really been wanting to make this pillowcase since Christmas and I finally set aside some time Saturday afternoon for this. The pillowcase part came together perfectly. Lori thought of everything in her pattern and instructions. 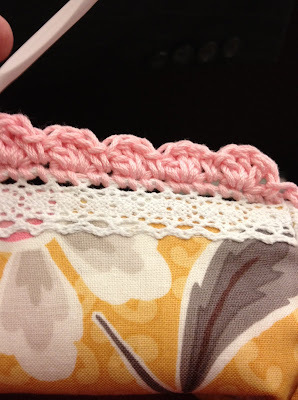 Sewing the cotton lace trim onto the end of the pillowcase opening makes the most clever way to crochet the edge onto the pillowcase. I had a meeting Saturday night and I put the pillowcase and everything into Lori's project bag and took it all along to crochet while I sat listening. I was finished crocheting before the meeting even finished. It was a perfect project for a winter day. The pillowcase is a 1 yard wonder. It is so cute I just can't wait to make more. Thanks so much Lori. You are just the smartest. This was the best gift. I have, what could be, a dangerous past time. I like to window shop at Fat Quarter Shop. 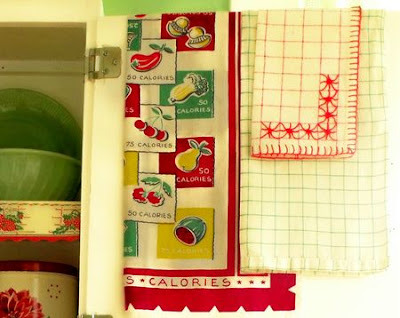 I discovered Kimberly's store years ago when I was trying to find fat quarters online. 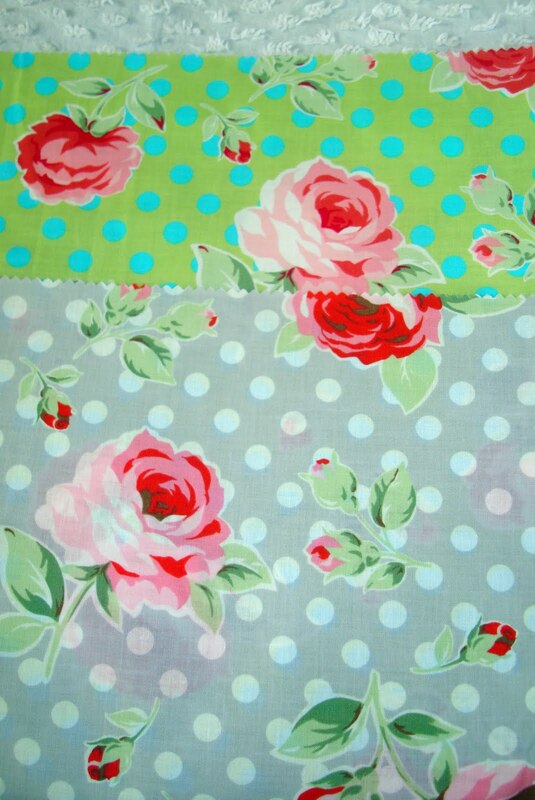 At that time most online fabric stores wouldn't sell less than 1/2 yard. 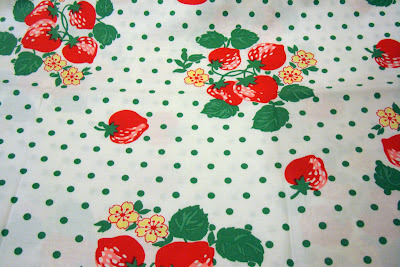 So I was very happy to find that I could shop online for those little cuts of fabric I like so much. Of course I also like to obtain fat quarters from local shops as well. It is hard to walk into a fabric store and not come out with 1 or 2 fats. I have been waiting and waiting for FQS to get in Lecien's latest line, the Flower Sugar Fall 2011. Of course there are several colorways and I thought I would show one of them. 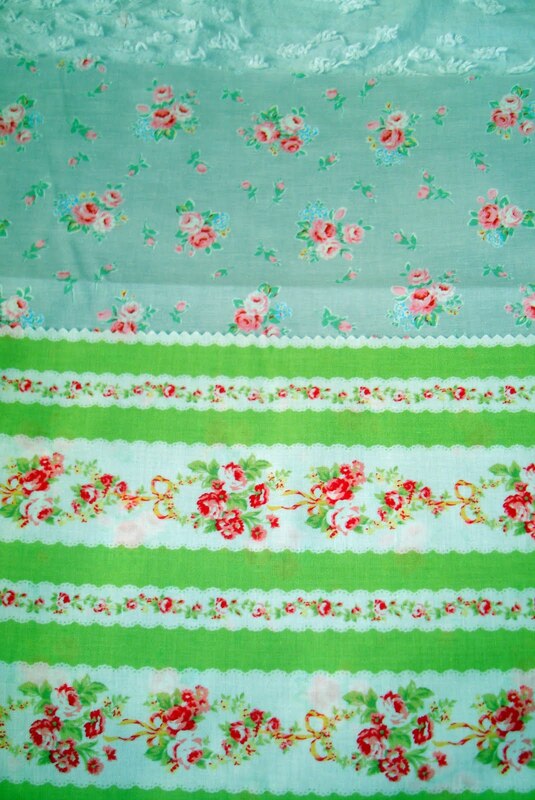 I want every single piece of this line and fat quarters are the only way I can do that. I'm really into the gray right now. And I'm always always into roses. I am loving the return of this neutral shade of gray above. I'm seeing gray in so many new lines. The gray flower is my favorite in the line. I photoed it with the green stripe above. I always like stripes in a line and what is better than a stripe? A stripe with roses inside, of course. 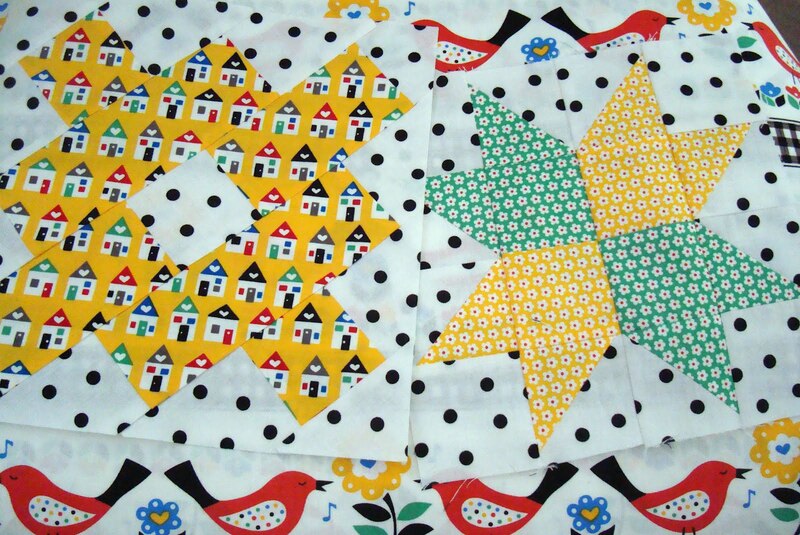 Yellow is always a favorite of mine in a quilt. 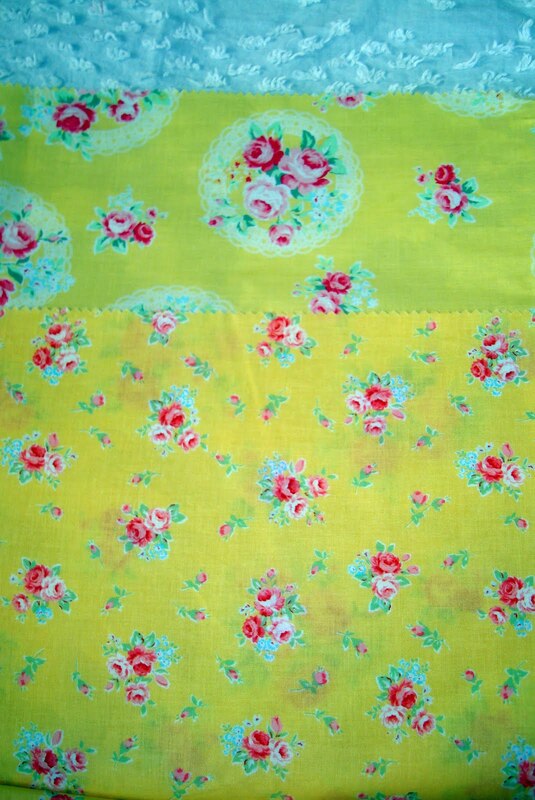 These 2 yellows with roses are so pretty and would go with most any of my stash fabrics. 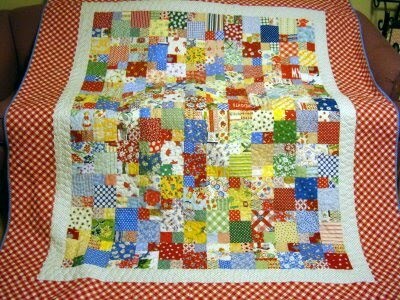 The top quilt on my bed is my mosaic quilt with lots of different fabrics squares sashed with white. 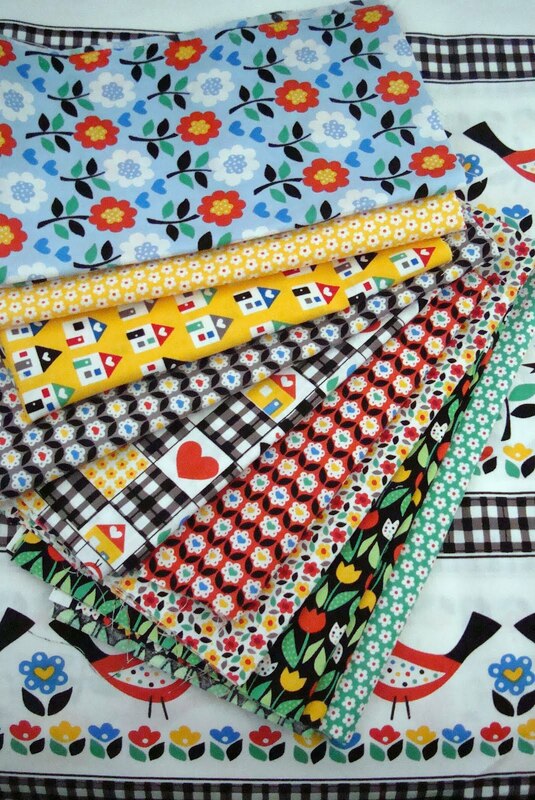 As I was making my bed today the dot fabrics in the quilt caught my eye and I was thinking how much I love bigger dots on fabric. Again, what is better than a nice sized dot? A dot paired with roses! I do also like these circles of roses. Last night I dreamed about blue fabric (I really did). And of course I got up this morning wanted to make something with blue in it (I just finished binding my PKM Row quilt with lots of blue). 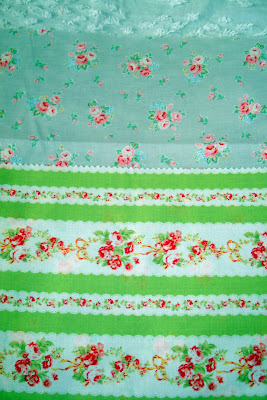 This blue in the middle fabric is a stunning shade and so unusual paired with the shade of green. 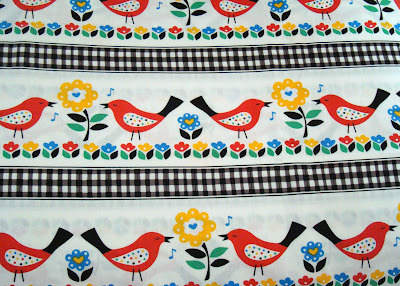 I am going to work on my pattern for the Row-By-Row quilt this weekend. I hope I get a lot done. I'm running behind schedule. Wishing us all a nice weekend. 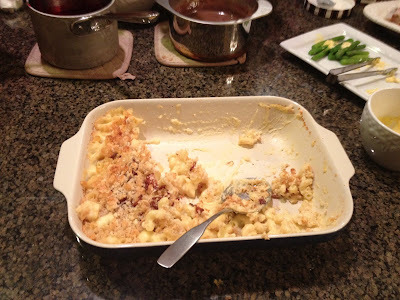 You know I'm such a Scrooge and I'm so glad Christmas 2011 is over. So on with the challenges of a new year. 2012 has kind of started off rough with broken cars, broken furnace and a stubborn infection for me. But that is life. We wouldn't know happiness if we didn't have problems for comparison. 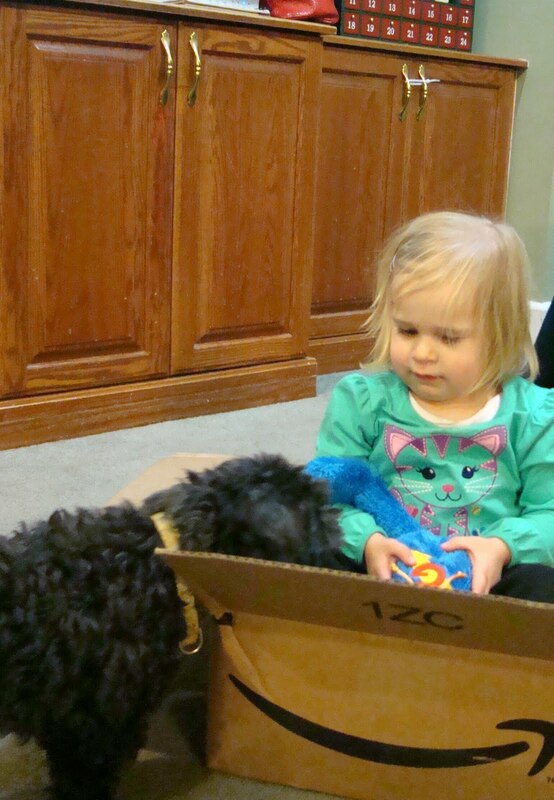 True to form, Allison played with a box after opening her gifts. Shadow is very interested in her new Grover from Nanny and Pa. I did want to show a few fun things even this old Scrooge enjoyed. 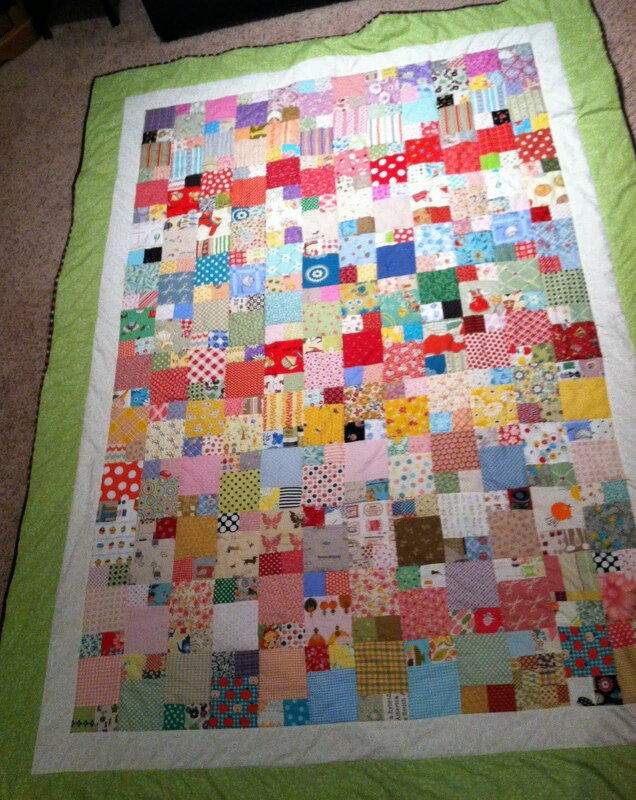 Here is Allison's kitty quilt I made for her. 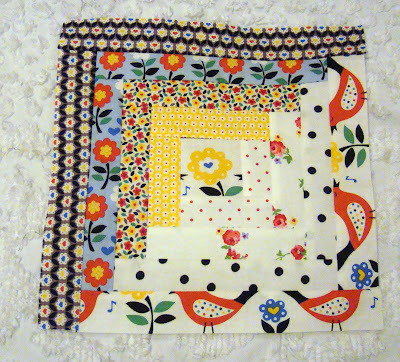 Pam's panel is perfect and all I had to do was attach a small outer border around the panel block to make a darling quilt. 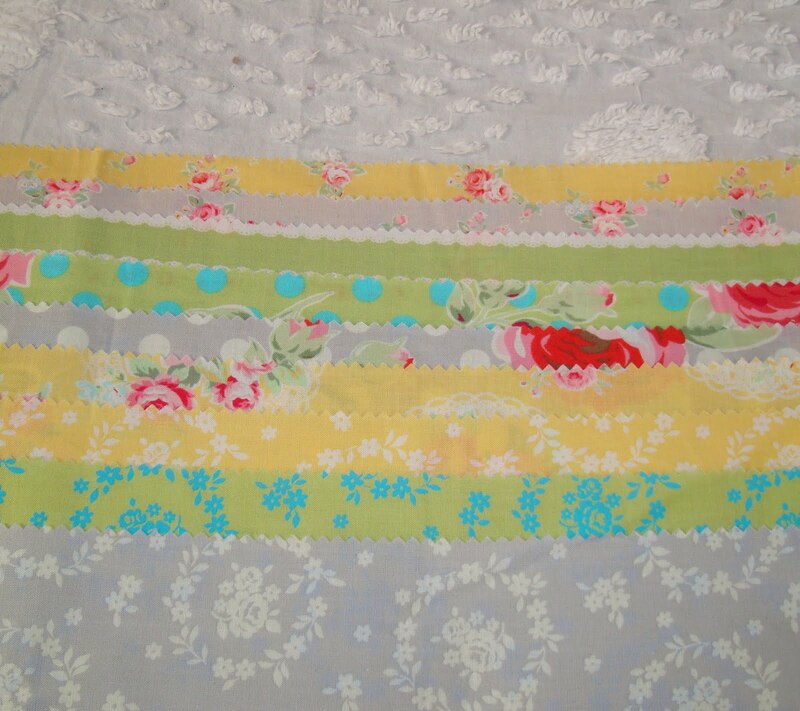 My quilter did a very open machine quilting design because I put eyelash Minkee on the back. Keeping a vacuum handy is a must for working with this stuff. 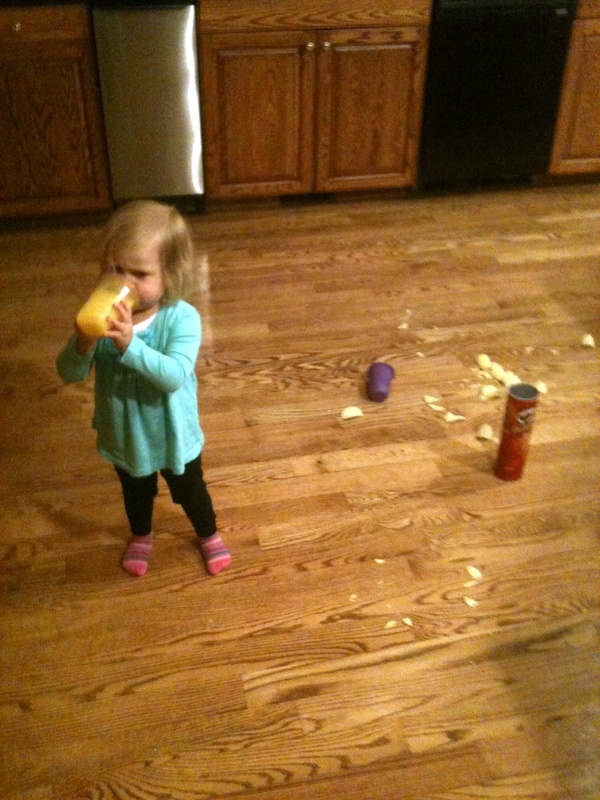 What a mess! And I put my binding on backwards so the hand stitching was in the front to make stitching easy. Allison hasn't taken it home yet. I hope she enjoys it. 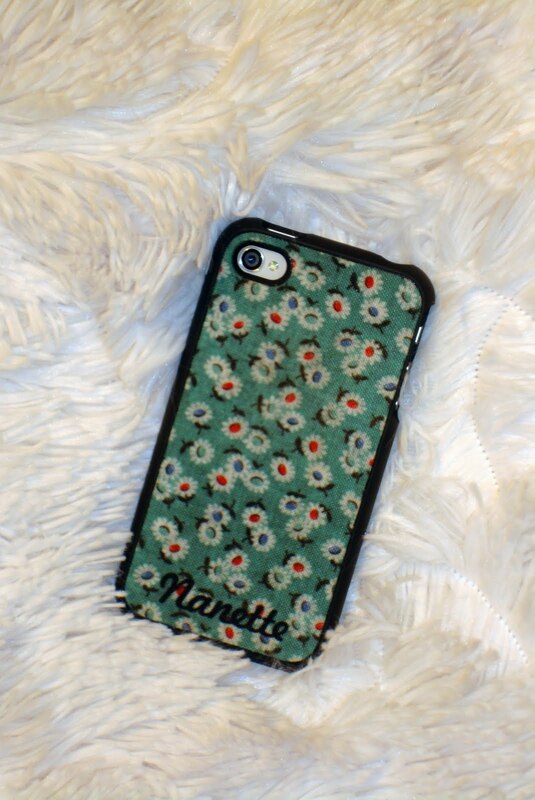 I really love my new phone case. 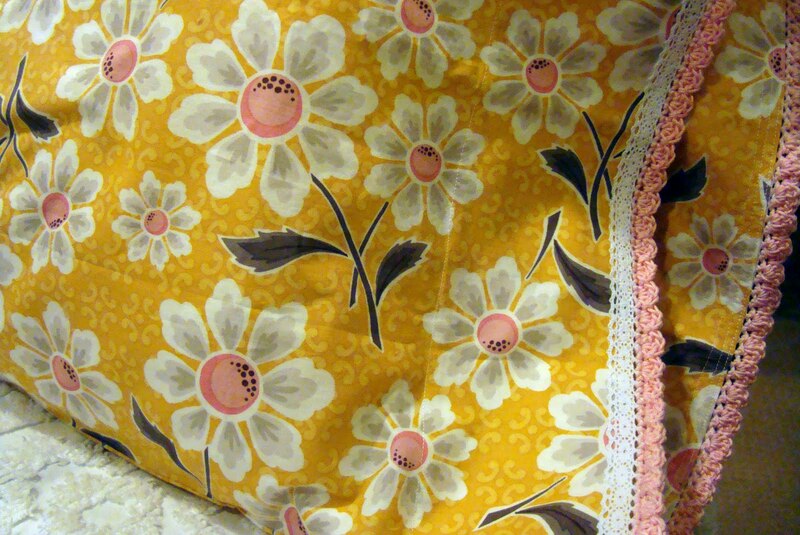 It looks like vintage fabric and it has my name on it. 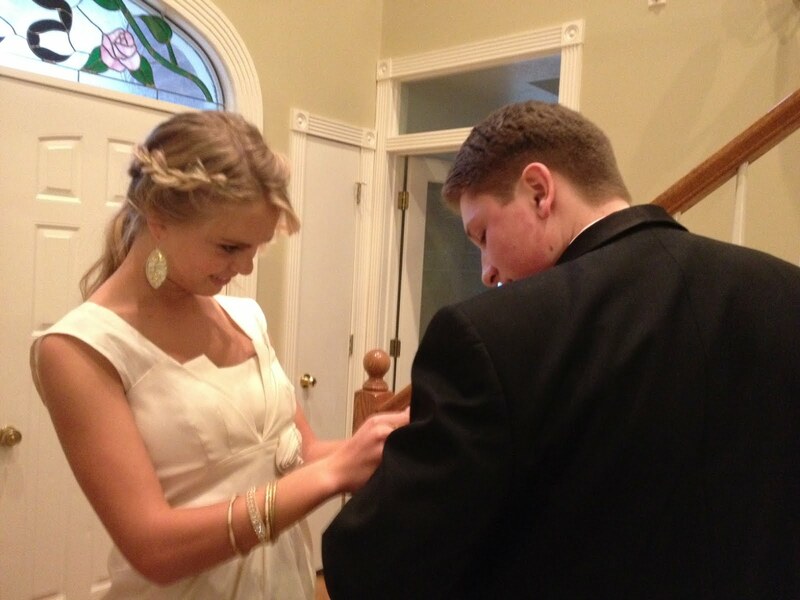 Pretty snazzy. My friend Laura gave me this book. It is such a perfect gift for me. I enjoyed browsing through it over the holidays and I'm going to put it to use next Christmas season. My family always comes through for me. 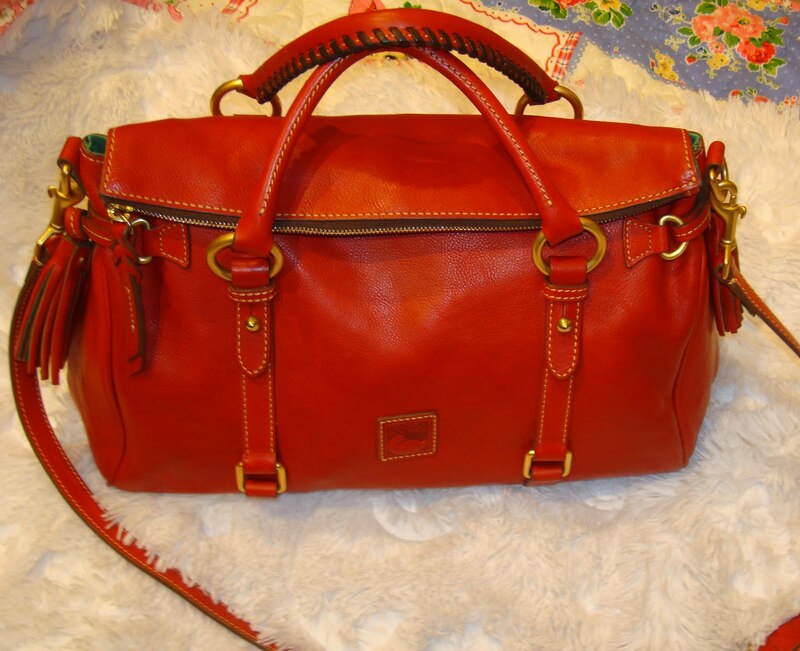 I did get several really nice things but the star is this bag that I looked at online at least weekly for the past 6 months. It is so pretty. And of course I love the color. It's an incredibly ritzy gift for this old Scrooge. I was really happy to join Jodi in her month of scrap ideas. 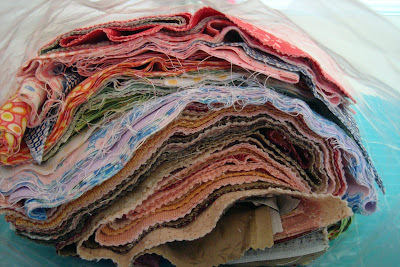 I know for me, scrap quilts are the heart and soul of quilting. Managing our scraps is something all fabric lovers have to deal with. Thank you to everyone that is a devoted blog reader and also to my new readers. I appreciate your participation in the giveaway and for all the sweet comments. Today I'm really excited to announce the winner of last week's giveaway. "Count me in, for sure. I love scrap quilts and I know what a wonderful way it is to use up those leftovers. I participated in Jodi's scrap-a-long last time and used up all my 30s scraps. 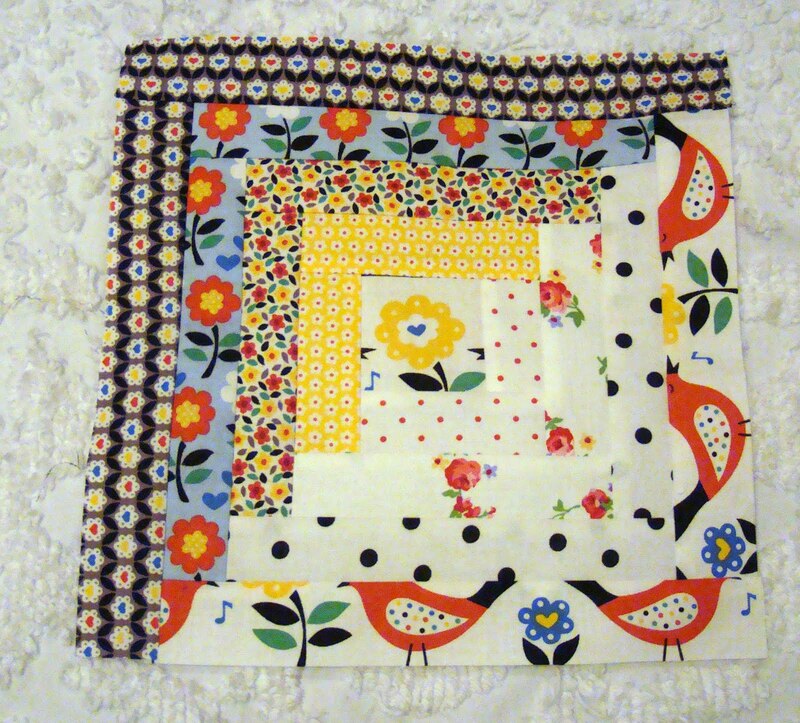 And what a lovely quilt it made. Winning your scraps would really get me going. Thanks for being so generous." Congratulations to Heartsdesire. I'll get your prize off to you right away. I hope you're inspired to get out those scraps in your sewing room and use some of the ideas Jodi has shown or to make my easy picnic quilt. I received this photo from my niece Tricia last week. 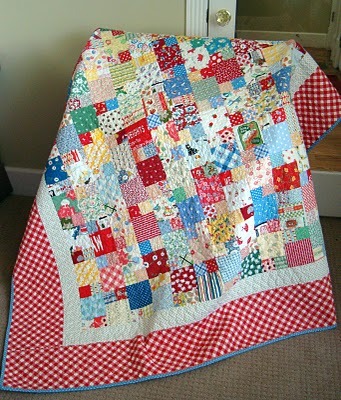 Tricia finished her picnic quilt we started at our family retreat in October and she hand quilted it herself. I am so proud of my sisters and nieces for taking on the tradition of sewing and creating and I'm very happy to pass on the traditions learned from Freda, my mother. She would be so proud of Tricia. 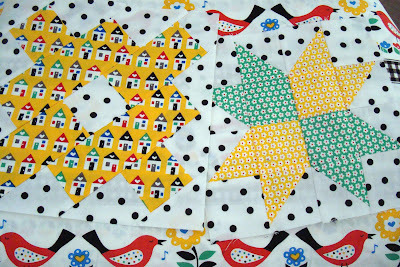 Have you heard about the 2012 Sew Scraps Along at Jodi's Pleasant Home blog? 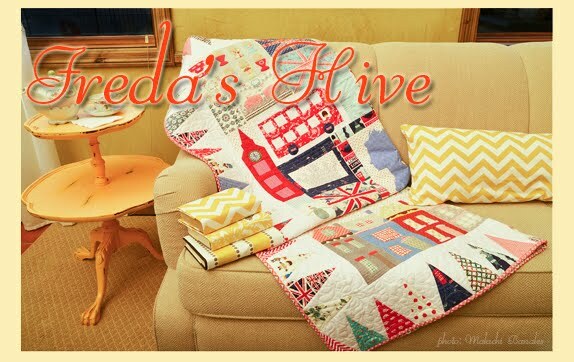 Today Jodi is kicking off her month long of giveaways, tutorials, ideas and more and I'm her first guest designer using my tutorial for a Picnic Quilt. 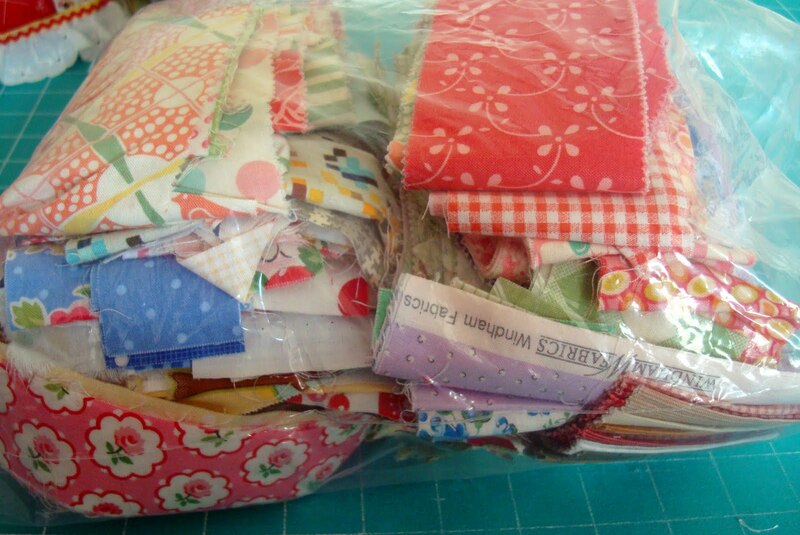 If you are a regular reader you will be familiar with my scrap busting Picnic Quilt tutorial. 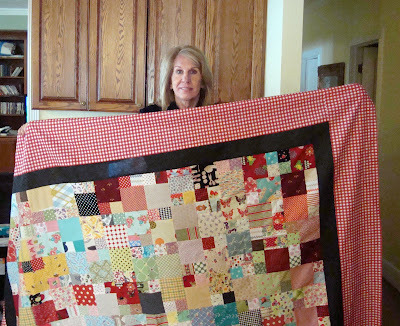 We used this tutorial for my family quilt retreat last year. If you are a new reader, my free tutorials are on the right sidebar. January is a great time to clean out your scraps and make a quilt for summer. I keep my scraps in a (clean) trash bin under my cutting table. 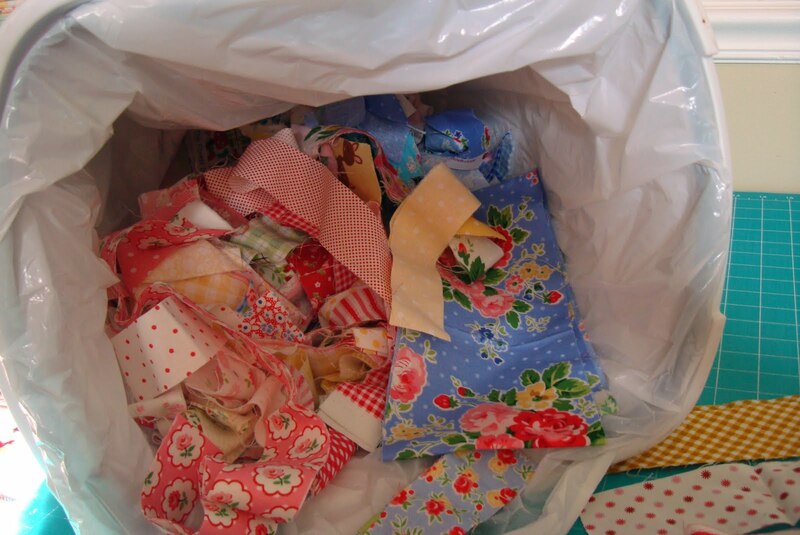 When I have scraps I just throw them in the trash bin and then recycle them in other quilts or give them away. If you want to participate in the scrap giveaway here or at Jodi's blog, leave a short message and make sure your name and contact info are included. I've loaded up a scrap bag for giveaway with some very recent and some distant scraps/pieces. 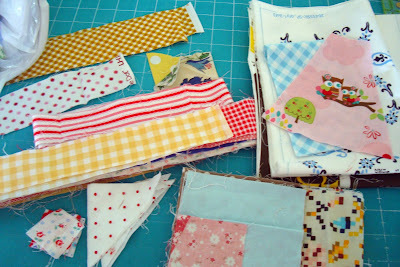 I've even included some of the scraps from my Row by Row PKM quilt. 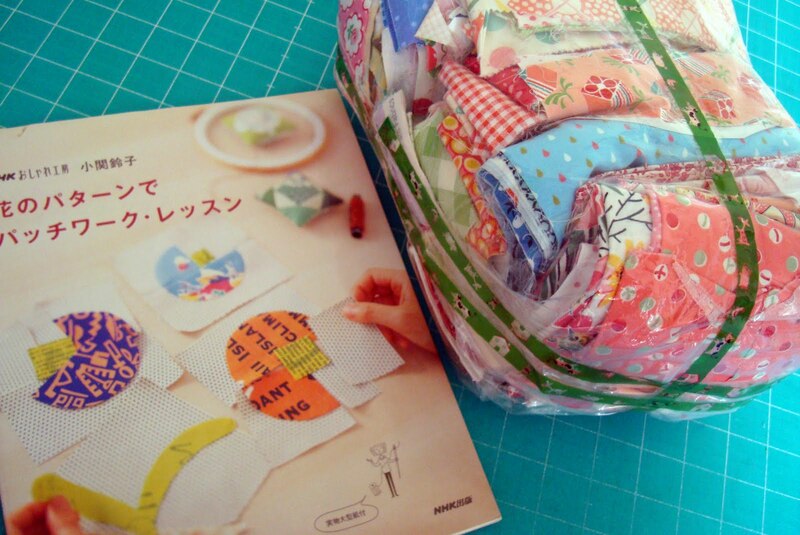 I'm also including a Japanese Quilt book by Suzuko Koseki with my bundle of scraps. 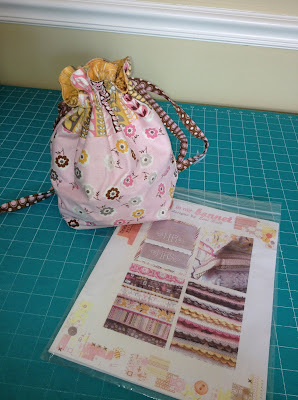 If you are interested in receiving my scrap bag and the book, head over to Jodi's blog for instructions and leave a comment here with this post. This post will run through the entire week. Saturday January 7 at midnight MDT is the deadline to leave a comment. I will post the winner for the giveaway Monday January 9. It is a new year people and time to clean things out and use up those scraps and good intentions.